Grab15% offYour First Order with a code -first15! GuruDissertation.com is a relatively new writing service which has created a small amount of online buzz, which we picked up in our normal search for writing companies to review. We decided to investigate and prepare a GuruDissertation review, based upon the factors we normally use – information that the website provides, GuruDissertation customer reviews, writing samples provided on the site, pricing, benefits, customer support based upon our contact with the company, and the quality of a research paper that we order. The following review is the result of our investigation. The name of the company would lead students to believe that it only offers graduate level capstone project research and writing. In fact, however, the company provides academic writing products and services to students who are of high school age and on up through the Ph.D. level. We wonder why Guru Dissertation has chosen this name for its company, for students in high school and college who search for a writing service might very well skip over this one. In addition to academic products, the company offers editing and proofreading as well as admissions essay services. We judge quality based upon content writing on website, samples, Guru Dissertation testimonials located on the site, off-site comment and feedback, and the nature of the research paper we ordered. The site is very “bare bones,” perhaps because it is new. There is very little text; however, what text does exist has not been composed by ENL writers. The sentence structure, absence of the word “the” in front of nouns, and incorrect word usage are common for non-native English speakers/writers. Further, there are not testimonials found on the site at all – a fact we find a bit strange. There are also no sample writings available and when we asked customer support for one, we were told none was available. This left us with the research paper we ordered, at the college level, with the stipulation that only professional journals could be used as resources. Not only did the writing reflect non-native grammatical structure, but the resources were not professional journals as requested. We did, however, receive the paper by the established deadline. There is no GuruDissertation BBB membership, so no rating is available through that organization. We did speak with customer support on two occasions, once by phone and once by live chat. The reps were friendly and courteous but obviously foreign. They insisted that all writers were PhD degreed and are native English speakers. We strongly suspect this is not the case. Nevertheless, we are able to say that, despite quality issues, GuruDissertation is not a scam. 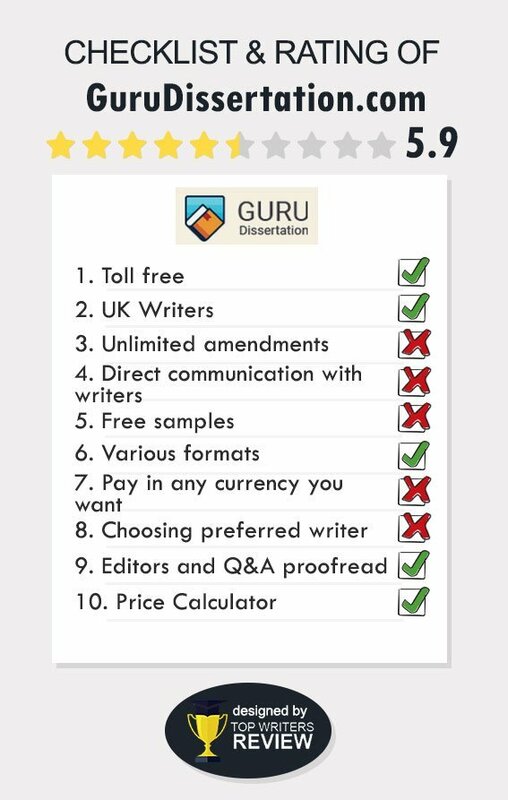 GuruDissertation.com prices are well within the average range, beginning at $11.30/page for a high school essay with a 20-day deadline up to $71.90/page for a PhD level work with a 3-hour deadline. Methods of payment are secure through a third-party processor, and customers may use any major credit card of PayPal. There do not appear to be any regular GuruDissertation discounts, other than a 15% discount for first-time customers. We were given a Guru Dissertation promo code to insert in our order form. We did inquire of customer support as to whether other discounts were available and were told that GuruDissertation coupon codes are occasionally offered for lengthy assignments if a customer requests one. The company allows revision requests up to two weeks after delivery, so long as those requests do not alter the original order. Although not publicized, we were not charged for our title or bibliography pages. I can't even count the number of mistakes you have made writing my term paper! I don't understand why do you call yourself professionals? The paper is really bad and isn't worth the money I have paid for it. I'm not impressed with the level of provided academic papers. They contain a lot of mistakes and not only grammar mistakes!